We’re checking out our reflection with this beauty and it looks on point! Make it a night to remember in an equally glistening mini and an opened dance floor! 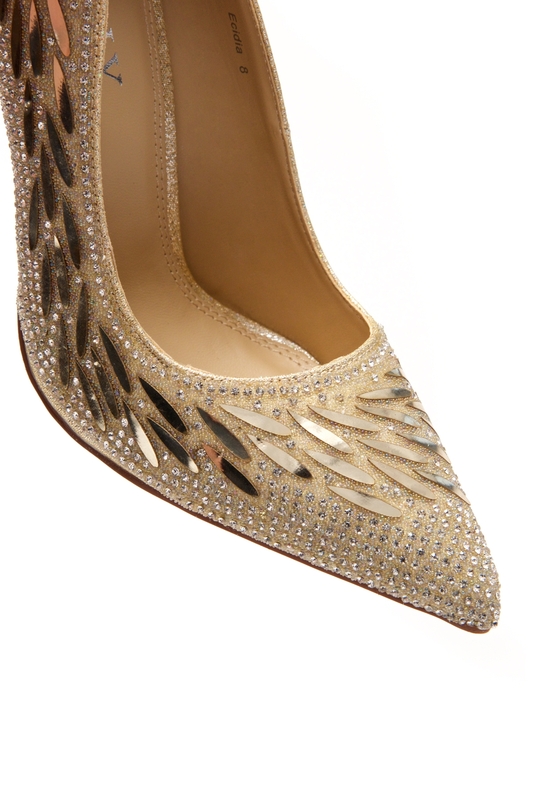 ECIDIA features a pointed toe, stiletto heel, jeweled embellishments and a lightly padded insole for comfort. Available in Gold and Silver. It fits as I expected and it is so comfortable. I walk like Kardashian way! It looks exquisite with my black dress. I would have paid $24.99 for this type of quality stiletto heel. This Gold Stiletto Heel is amazing like 18k Gold. Very happy with my buying experience. no fuss and smooth order. I would love to buy again until my next salary day! I love it to death!! The gold and jeweled embellishment make this stiletto shoes extraordinary!!!!!! It was beautifully made. Hands-up for the Shoeland Team! Thank you! I love these heels! Wore them to homecoming and got so much attention! They\'re also comfortable to dance all night in! These heels are just so pretty! I got so many compliments when I wore them to homecoming. Will be buying more!